Welcome to my latest annual review of the progress of building I-73, I-74 and other Future Interstate routes in North Carolina. 2018 saw the completion, for the time being, of the remaining I-73 construction projects, the expansion of I-74 construction, and the establishment of one new interstate route, I-285 between Lexington and Winston-Salem. 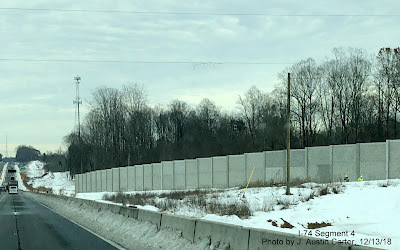 Work was completed on the US 220 widening project between Summerfield and NC 68 in December 2017, however the route was not officially signed until March 2018. Completion of this segment extended I-73 northward about 4 miles just beyond NC 68. This will be the northern limits of the route for the time being. At the southern end of state work too was completed, for now, on I-73 (and I-74) in the Rockingham area. The first section of the Rockingham Bypass, the upgrade of 3 miles of US 220 to Interstate Standards was completed in June 2018. The project includes a new exit at Dockery Road/Haywood Cemetery Road and the completion of what will be the future ramp from I-73 South/I-74 East for US 220 South. The FHWA formally accepted this southern part of I-73/I-74 into the Interstate System in September 2018. First overhead sign northbound with I-73/I-74 shields at Dockery/Haywood Cemetery Road exit. I-73 now runs continuously for 101 miles (Exit 22 to Exit 103) and will not grow any larger for a few more years. The end of 2018 saw NCDOT add the last phase of the Rockingham Bypass to its project letting list for October 2019, construction could therefore be started in a year and be completed by perhaps 2022 or 2023. The last northern segment, from NC 68 to the Virginia border, will probably take longer to complete. 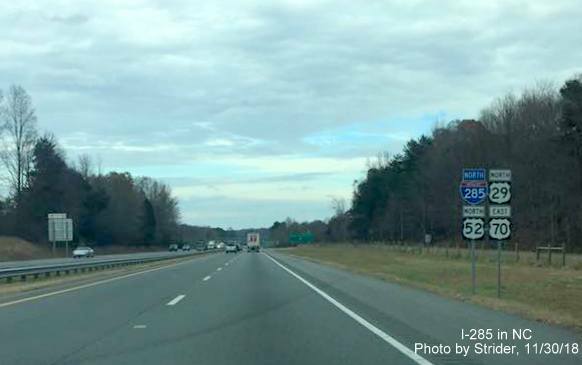 While projects to upgrade US 220 to interstate standards were considered for the upcoming 2020-2029 State Transportation Improvement Plan (STIP), none scored high enough according to NCDOT's priority scoring method to be added to the list. It therefore may be beyond 2030 before any work is started along this segment. While no new segment of I-74 alone opened in 2018, there is cause for optimism about the further expansion of this route in the next few years. Work continued on the Winston-Salem Northern Beltway. While opening of the first section from Business 40/US 421 to US 158 was postponed from the spring of 2019 to the end of the year, work officially started on the remaining segments from US 311 to US 52 and work also started on building the future interchange between I-74 and US 52. Work is scheduled to be completed on the Beltway by 2023 including the segments from I-74/US 311 to Business 40. The only other major news on the Winston-Salem area segments was the approval by AASHTO in the fall of 2018 to remove US 311 from the route. Though it was publicized that this would happen by the end of the year, no signs have been removed, so far. As far as I-74 in southeastern North Carolina, many projects were accelerated during 2018. This included the adding back of upgrading US 74 between Rockingham and Laurinburg to the funded project list with work to start by 2028 and the acceleration of several projects east of Lumberton to replace intersections with interchanges along US 74. Work started on upgrading Broadridge Road in Robeson County while the project to upgrade the intersections of NC 130 and NC 72 into one interchange are now scheduled to start in the spring of 2019. Several of the remaining projects in Columbus County have been moved up to the early 2020s. As of 2018, I-74 totals about 125 miles in 3 separate segments. 2018 saw the birth of North Carolina's newest interstate, I-285. The route along Business 85 and US 52 freeways between I-85 in Lexington and I-40 in Winston-Salem was signed (so far only with ground-mounted shields) in November 2018. I-285 signs replaced Business 85 at the southern end of the route. Newly added I-285 shield, replacing Business 85, northbound in Lexington. While the Business 85 shield was removed, the route, unlike it's northern segment along I-85 through Greensboro which was removed officially in October 2018, has not been decommisioned, but it's prominence is being reduced on exit signs on approaching roadways. I-285 may be extended to I-74 after the completion of the eastern segment of the Winston-Salem Northern Beltway. The next new interstate scheduled to be signed is I-885 in Durham as part of the completion of the East End Connector project, currently scheduled for the end of 2019. Much work still needs to be completed at the Durham Freeway and US 70 ends of the project. US 70 West traffic travels under bridge under construction as part of East End Connector project. 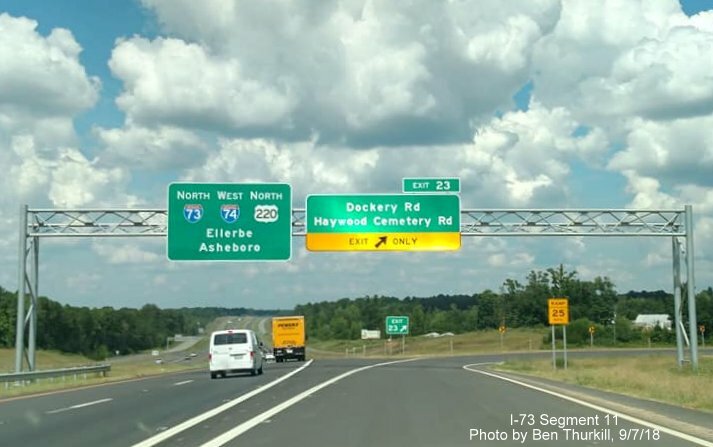 There was not much to report about North Carolina's two new 2-digit interstates, I-42 and I-87 in 2018. Though ground-mounted signage for I-87 went up in 2017 in the Raleigh area, this has not been followed, as many expected, with new overhead signage. There should be progress on this front in 2019, however, as work to install new I-87 signs is part of a contract widening I-40 between I-440 and US 70. According to the Request for Proposals for that design-build contract, the new signs should be up by the summer. 2019 also will see the first projects to bring parts of US 17, US 64, and US 70 (along with US 264 for I-587) up to Interstate Standards. Pavement rehabilitation projects that will widen shoulders to Interstate specifications are to be let for US 70 in Johnston County in May 2019, US 64 in Nash County in July, US 64 in Martin County in September and US 17 in Pasquotank and Camden Counties in October. Work to upgrade US 264 for I-587 in Greene County is supposed to be let in May 2019. Meanwhile, work is to start on the US 70 Havelock Bypass, part of I-42 in the spring of 2019. The final contracts to complete the Fayetteville Outer Loop, Future I-295, though delayed from January are now to let separately, the first from Raeford Road to Strickland Bridge Road in May and the second (separated for "strategic planning") from Strickland Bridge to Camden Road will be let in September 2018. Work is to be completed by late 2021 or 2022. Not currently an interstate, but possibly in future plans, the Monroe Expressway, of US 74 Bypass, a toll road was opened in November east of Charlotte, many see this as part of a future interstate route between Charlotte and Wilmington. NCDOT is also working with officials in the Goldsboro area to figure out the route for the extension of I-795 to I-40, work isn't planned to start though until 2027. I would like to thank all those who contributed news and photos from North Carolina for inclusion in my I-73/I-74 and Future (and New) Interstate sites including Strider, J. Austin Carter, Adam Prince, and Ben Thurkill. I hope to be able to travel south to drive the routes myself sometime in the next year. As always, the latest updates can be found on my MalmeRoads site: I-73/I-74 in NC and NC Future Interstates.